Traditional business models and methods are based on sound business texts and programs. You have the business plan, the marketing calendar, and the accounting packages. In theory, we just plug into these models and viola, a successful business! Right? Well, maybe but more likely it takes a while to find that magic and see the success the best business books promise. Why? Because we have to find our way of doing business. There really is no such thing as one-size fits all in anything–clothes, diets, schooling, and business. Sometimes finding the rhythm of your business is challenging for you and you wonder how to know what direction is right for you. All the wise sayings by famous, successful, and/or spiritual people just seem to contradict each other. For example, “Follow your heart,” “Only hard work and determination will make it happen,” “You have to know when to quit,” and so many more. In my experience, finding the rhythm for success (please use your own definition) is a dance with God (the Universe, Higher Self, intelligence, Spirit, your belief system of choice). This dance is all about learning to feel the rhythm and hear the music. 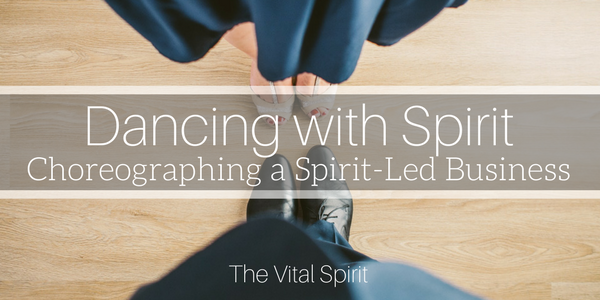 For each of us, this experience will be different and finding the dance floor can be challenging, so I decided to put together some helpful steps for leaning into our life and learning to dance our Spirit. First, we have to find the dance floor. Running a Spirit-led business is different from running it from our own ego or logic. Letting Spirit lead means learning to go within and stop letting our subconscious run our lives and act out our fears. Meditation and mindfulness are the keys to the ballroom. A life of meaning and joy starts by becoming aware of when we are acting out of fear as opposed to joy or love and working to choose joy instead. This first step is often started and abandoned (sometimes many times) before being picked up again. It isn’t comfortable to see ourselves in our fear and pain, but I can promise you that it is worth the difficulty. The only way I have found joy and fulfillment is through releasing my baggage and fears. Hearing the music–allowing your own interests and desires to call you forward. Once we have found our way onto the dance floor through awareness, we can begin to hear our own true interests and desires calling our attention: our personal soundtrack if you will. Society, family, and friends often create for us our roadmap to success. We want to fit into the crowd, please our family and impress our friends so we choose careers, businesses, and make decisions on how to run them based on a lot of input from others. By getting in tune with ourselves and the vision of our business, our own wisdom begins to bubble to the surface. We have a vibrant business waiting for us that is fulfilling and abundant when we learn to hear our music. And following your own guidance is going to go a lot better for you than trying to live somebody else’s vision. Feeling the rhythm–playing with the synchronicities and coincidences. Now that we can hear the music of our soul, the next step is feeling the rhythm. This is the step on the journey where we get to start playing, taking action and learning the language of Spirit. I am sure you have noticed those times when synchronicity and coincidence seem to underscore some revelation you have had. For example, a job offer falls through just when you realize that you don’t think it is right for you, an opportunity to learn a new skill presents itself immediately after telling someone that you had found a new interest, or the stars align and you find the perfect office space in a neighborhood you love. These coincidences are how Spirit communicates with us. This language is complex and quiet. Learning to use our intuition and follow the signs of Spirit can take time but by taking action and acknowledging each synchronicity, we will create more of them, feeling our own rhythm with Spirit. Being open to your partner’s (Spirit) lead–this is a two-way street. Allow for the possibility that your way is not the only way and learn to let go, trusting that Spirit will bring you towards your dreams. Dancing is a give and take. Sometimes we get to lead and sometimes we have to follow. When things in our path become difficult or disappointing, pay attention, instead of digging in your heels and trying to force the matter, let go and accept that there may be another way to achieve your goal. Allow Spirit to lead you towards the next, most appropriate opportunity. I will be honest and say that after step 1, this is by far the hardest part. Many an entrepreneur has gotten tripped up and derailed for a while in just this spot. We fall in love with our goals and the plans we have made to achieve them, we get attached to the people, places, and things that we believe are supposed to deliver us to the promised land. And sometimes we don’t see the big picture, that our goals are not meant to be achieved in a single line journey from point A to point B. Often we get to experience detours. These detours can bring disappointment or setbacks, these are our life lessons and cannot be avoided. Spirit will always reroute you towards your dreams and goals if you allow it. Letting go, surrender, and acceptance is the path through disappointment and heartbreak. By letting go, we allow Spirit to lead the dance for a little while. Unleashing your self-expression–allowing change and remembering to add your energy to the dance. Two things can happen during the dance with Spirit: 1. as we evolve and grow, we can sometimes outgrow our goals or desires, and 2. we come to depend a little too much on Spirit’s lead, meaning we forget to put our desire back into the dance. Being conscious to stay in touch with your interests and desires is important. Goals and desires change as we grow. Letting go of a goal before we achieve it doesn’t mean we have failed or we are flaky, it just means you learned what you needed to by having it as a goal and you can now update your dreams to better reflect where you are now. Then, there are times we enjoy the experience of Spirit leading us so much that we forget we have to participate too. Our business is for us, not Spirit alone, to create. It is meant be a partner dance, not a solo by either partner. We put our energy into the mix or we will stop the dance. Our business can thrive and be deeply fulfilling when we learn to dance with Spirit. There are still plenty of challenges but the confusion diminishes and the occurrences of joy and achievement increase. You will hear the music, feel the rhythm and experience the magical sensation of dance with a partner who only wants the best for you. Life and work becomes extraordinary.